Stop Saying Japanese Students are Obedient! During orientation for a trip to an American high school, I told the students, “If you fall asleep in class, you’ll get kicked out. If you talk during class, you’ll get kicked out. If you misbehave, you’ll get punished.” My Japanese students were shocked. Their eyebrows lifted and their mouths opened after they processed my words. I’ve worked at seven junior high schools and two senior high schools in Japan, and 95% of the classes are the same. Kids fall asleep, chat, and read books during class. They destroy the stereotype that Japanese students are obedient students. When I told my high school students that they couldn’t do those things, they couldn’t imagine what class was like, especially when an immediate punishment followed their behavior. Disruptive and sleeping students don’t get punished right away, that is, if they get punished at all. Teachers wait until the end of the day to lecture students or send them to the discipline committee for punishment (writing an apology essay, cleaning early in the morning or after school, parent-student conference). So far, the best schools I’ve taught at had swift punishments for troublesome students. I’ve seen one junior high school student sit on his knees in traditional Japanese style for thirty minutes listening to three teachers yell at him about his disruptive behavior. In the end, he cried, and I never saw him near the teachers’ office again. Where does this “obedient Japanese student” come from? My guess is what silence means to a Westerner versus a Japanese person. In the West, silence means that you’re listening and being well behaved. In Japan, silence can mean anything. My students will sit and stare at the clock without feeling bothered. When the test rolls around, students leave nearly half of their tests blank, including multiple choice questions. It’s my students’ way of protesting school. The culprits of such a bad system? Japanese culture. Learning is not designed to be from Person A to Person B and that’s it. Learning is about taking the new information, reshaping it in certain situations, and applying it. In Japan, the direct approach does not exist except in English class (on a varying level). Ask, “What’s ‘cat’ in Japanese?” and 40 pairs of eyes blink at you as if they don’t know what a cat had two pointy ears and said, “Meow”. English is hard to learn–and so is Japanese–but when administrators just want students to parrot words and sentences, how much of that is learning? Aside from the classroom setting, Japanese culture has one thing that hovers on the shoulders of all Japanese people: wa (和), meaning peace, or “Don’t rock the boat”. There are over 157 million people in Japan, which is the size of California. That’s a lot of people, and that’s not a lot of space. With so many people breathing down your throat, wa is a way for Japanese people to stay sane. Instead of giving your opinion (from Point A to Point B), you say your opinion in a round-about way (from Point A to Point D to Point C to Point B). What you really feel is hidden beneath a guise called honne (本音) while what you say is seen as tatemae (建前). English has an opposite design–I’m going to give it to you straight. Westerners want to be understood regardless of things such as feelings. We don’t have physical space to worry about. But Japan has a space crisis and overpopulation, and this system of wa permeates all of Japanese life, including school. Even if my students pretended to be obedient Japanese students in the American school they visited, I know it’s just a front. This entry was posted in Japan (日本), Life (生活) and tagged English, honne, image, Japanese, obedient, people, school, stereotype, students, tatemae, teacher, teaching, wa. Bookmark the permalink. I agree, similar thing in China. The stereotypes are not true. The whole “Asians are obedient” are not true. I’m an asian student, and I know for a fact that this is true ^_^. Also those who have watched a lot of Anime will see that the stereotype above isn’t shown at all. 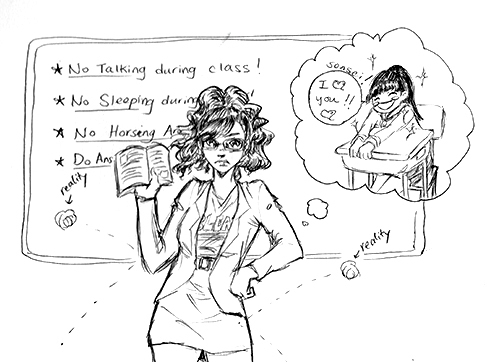 Most animes that depict school life show most of the class slacking off in some way, while a select few (Tryhards) actually paying attention. Maybe this stereotype only came about because westerners only see the high achieving people, the ones who do get scholarships to foreign countries, instead of those who are left behind.